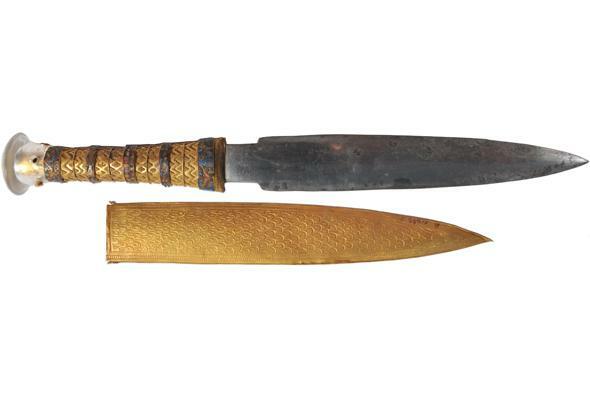 King Tut's dagger proven to be from a meteorite. I never in my life would have thought I’d pose this question, but guess what King Tut and I have in common? I was born in Virginia, not Arizona, so it’s not that. It’s this: We both have daggers made of iron meteorites. I bought mine (which, technically, is actually a letter opener) at a science meeting a few years ago, and it was the first meteorite-based item I ever got; I now collect meteorites and love them. It’s unclear where Tutankhamen got his (assuming it wasn’t the goa’uld), but a paper published recently in the journal Meteoritics and Planetary Science shows pretty conclusively it’s wrought from meteoritic material. That’s interesting historically —for one thing, it supports many studies showing that iron was used sporadically during the Bronze Age (in this case just a couple of centuries before its end, and the Iron Age proper began in that region)— but how they figured this out is also pretty cool. 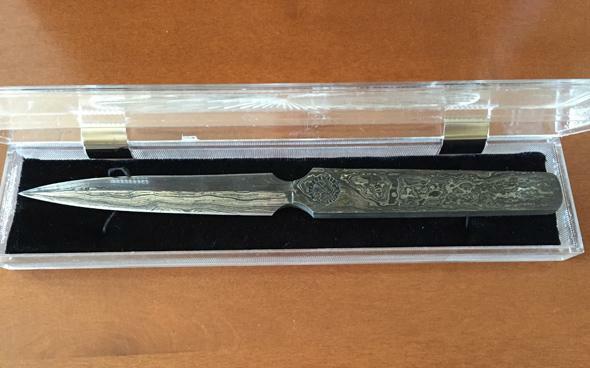 The dagger is 34 centimeters long, and has a gold handle with decorations. The blade is clearly iron of some kind, but IDing it as meteoritic has been difficult. Most methods involve getting a sample and destroying it (vaporizing it, for example), which is a problem when you’re dealing with a priceless artifact. In this case, though, they used a non-destructive technique called X-ray fluorescence (or XRF) spectroscopy. This beams high-energy X-rays at the sample, which strips some of the atoms of their electrons. Other electrons then move around to fill the hole left behind, and emit X-rays when they do. Different atoms emit X-rays with different energies, and new detectors in portable XRF spectrometers are sensitive enough to taste those X-rays and sort them by their energies. 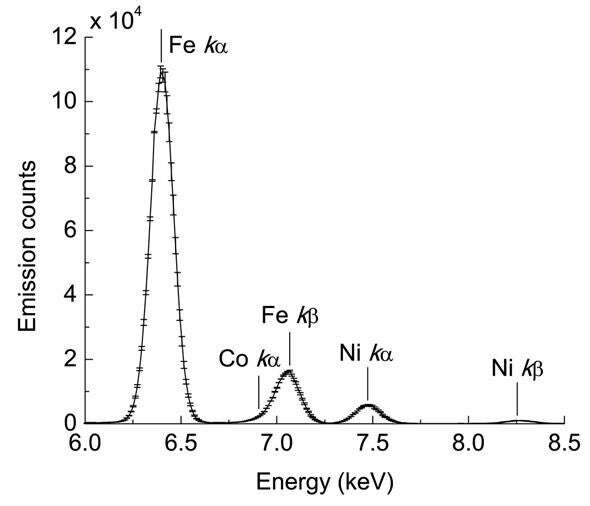 The X-ray fluorescence spectrum of the dagger, showing the presense of iron, nickel, and cobalt. That plot shows the X-ray spectrum they found for the dagger. Each bump is energy emitted by a different kind of atom: iron (Fe), cobalt (Co), and nickel (Ni). Each atom emits X-rays at different energies, so each bump (technically, we call them “lines”) has its own name; thus Fe alpha, and so on. The size of each line depends in part on the amount of material present, so by carefully measuring the lines the percentage by weight of each element can be found. They determined the dagger is about 88 percent iron, 10.8 percent nickel, and 0.6 percent cobalt. This is very much what you’d expect from a meteorite, and very different from terrestrial iron ore.
That confirms the metal from this dagger used to be part of an asteroid circling the Sun which fell to Earth some time ago. How cool is that? My own, decidedly much less pharaonic, letter opener from space. But you can tell more. The specific ratios of those metals can tell you which meteorite it was, or at least narrow it down. The scientists compared their results to meteorites from within a 2,000 km radius centered near the Red Sea, and found a near match in a one-kilogram meteorite called Kharga, that was discovered in 2000. It’s not a perfect match, but it’s close enough to indicate that such objects were available to the Egyptians. It’s been known for some time that ancient peoples used meteorites for iron, which makes sense in hindsight*. Meteorites fall from the sky and land on the ground, where they’re easy to pick up and use. They’re unusual looking, so likely to be found by a curious passerby, and obviously denser than other rocks so that they’re bound to be kept and even cherished. Working the metal is difficult, though, and Tut’s dagger was worked with some skill, indicating that even in the 14th century BCE ironmongers had some practice. I find this whole thing pretty wonderful. I’m fond of talking about how astronomy is not some remote field of science, but has an actual, physical connection with people. It also gives us insight into our ancestors millennia ago. When we look out at the stars, we are actually looking inward at ourselves. The Universe has shaped us and our civilization, and it has been our use of science that has led to understanding just how profound that impact has been. Top o’ the sarcophagus lid to Boing Boing. * Of all things, my first exposure to this idea was reading Philip José Farmer’s Riverworld science fiction series. Learning comes in all forms.